Oh Christmas. So highly anticipated and so swiftly experienced! It always goes like a flash doesn’t it? Have you had a wonderful time? I am feeling so happily full and rested, not to mention utterly spoilt. 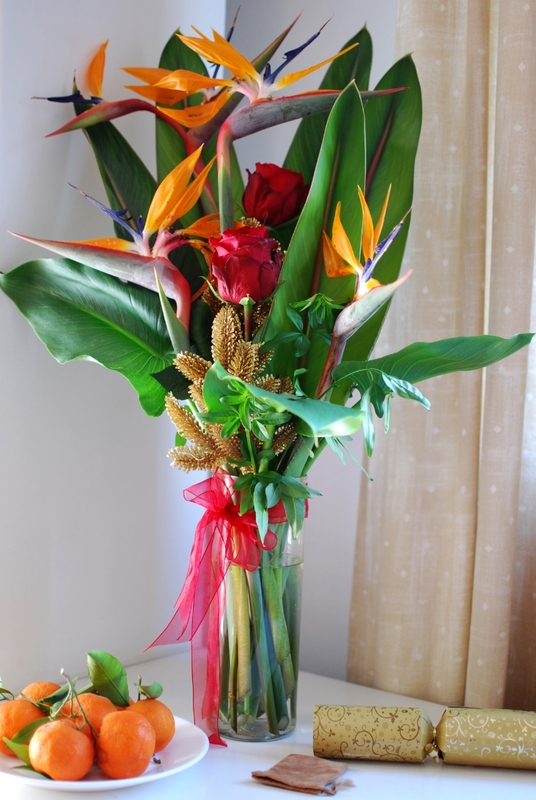 It makes me smile to look at this photo, with its bright tropical flowers and oranges picked from the garden. We went for a Boxing Day swim under blue skies and in warm(ish) seas and again, I couldn’t help but smile thinking of the traditional swims people take in the UK. It has made me start thinking about how Christmas always feels exactly like Christmas, regardless of how we celebrate it. Everyone talks about traditions when they describe their Christmas, but when I think about it, I don’t think my family have had a Christmas the same as the one before for almost a decade now, since my sister was old enough to leave home. We’ve had my sister or I going to in-laws instead, friends have come over, we’ve celebrated in the north of England as well as the South, in France, Morocco and Cyprus, we’ve had Christmases at work, opened presents over Skype or with phonecalls, we’ve had both white Christmases and hot, sunny Christmases and even a Christmas without electricity last year! When you’re little, Christmas is often so regular and traditional, with your family doing things as they do, and then as you become an adult there comes this whole new phase where things change. New people, new places, new foods and new traditions are all incorporated and I have to admit, I’m enjoying it very much. Next Christmas will be mine and Harry’s first Christmas as a married couple and I know there will be plenty of times to work out our own little family traditions but until then it is lovely to know that all Christmas really needs to feel like Christmas is to spend it with people you love, eating and celebrating together. I hope that wherever you are, and whoever you are with, you have had a wonderful Christmas time. Now, let’s bring on New Year!